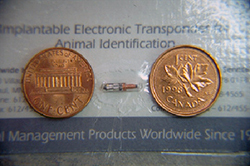 A microchip is a tiny transponder, about the size of a grain of rice that is encoded with a unique identification number. It is used for permanent identification in pets. The technology is relatively recent, but is becoming widely available. How is the microchip put into my dog? Before insertion, the sterile microchip is scanned in the package to confirm that the identification code of the transponder is the same as that shown on the package bar code label. The needle containing the microchip is loaded into the application gun or syringe, and the pet is positioned for the injection. For dogs and cats, the standard site for microchip placement is in the subcutaneous tissue along the dorsal midline (the spine) between the pet's shoulder blades. For correct placement, the pet should be either standing or lying on the stomach. Some of the loose skin between the shoulder blades is gently pulled up, and the needle is quickly inserted. The applicator trigger is squeezed, injecting the transponder or microchip into the tissues. After insertion, the pet is scanned to ensure that the chip is reading properly. Does it hurt to insert the chip? "...appears to be relatively pain-free..."
The procedure is fast, safe, and appears to be relatively pain-free in most pets. The chips are usually inserted without incident, even in the tiniest kittens and puppies. The application needle is quite large, and some clients will choose to have the microchip implanted at the time of sterilization, so that the pet can be anesthetized for the injection. However, this is not necessary, and the microchip can be implanted at any time that is convenient. Once your pet is microchipped, you must register him or her with the appropriate agency. Your veterinarian will provide you with the relevant documents and contact information and will tell you if any fees are required. Failure to register your pet's microchip identification will render the entire process useless. "If you move or change your contact information, be sure to update your pet's microchip information." If you move or change your contact information, be sure to update your pet's microchip information. If your pet is lost and recovered, this information is necessary to reunite you with your pet. The microchip can be 'read' with a microchip scanner, which detects the specific electronic code embedded in the chip, and displays the identification number on the scanner's screen. Since the occasional microchip may migrate, or move out of position, the microchip reader will be passed over the entire body of the pet in order to ensure that the chip will be detected if present. "Most, if not all, humane societies and animal shelters now have universal microchip readers, and routinely scan all stray and injured animals." Most, if not all, humane societies and animal shelters now have universal microchip readers, and routinely scan all stray and injured animals. Steps are being taken to standardize the readers and develop databases that can be readily accessed. In 2007, several news articles were published, implying that microchips cause cancer. The information was based on research with mice and rats that were genetically bred for their predisposition to developing cancer. No documented cases that link microchips to cancer in dogs exist, and there is no foundation in scientific fact to supports this link. Millions of dogs have microchip identification implants without any reported problems. My dog always wears a collar with identification tags. Isn't this enough? Unfortunately, collars can break, fall off or be removed. When identification tags are new, they are easy to read. However, as they get old and worn, it can become challenging to make out all the information that is on them. My dog has a tattoo already. Why should I microchip him? Unfortunately, tattoos can be very difficult to read. They are commonly placed in the flank area, where they can become obscured by hair. Even when they are in the ears, they can become faded over time, and the numbers and letters can become unreadable. They can also be readily altered. Even when they are readable, the information about the pet and its owner can be difficult to obtain since there are no common databases for this information. "Microchips cannot be misread, and the identification number is tamper-proof." Microchips cannot be misread, and the identification number is tamper-proof. The information about the pet and owner is usually readily retrievable from the database.